Kenya has urged the UN top decision organ to upgrade the security situation in the Horn of Africa to international levels and match it with financial resources. Deputy President William Ruto said the UN Security Council has failed to support the African Mission in Somalia (Amisom). The Deputy President however, said the UN has provided a minimal funds to repatriate refugees to Somalia and left the task of restoring peace on South Sudan to the regions Intergovernmental Authority on Development (Igad). Mr Ruto, who was addressing the UN General Assembly on Wednesday, said the effect of the delicate situations in Somalia and South Sudan and terrorist threats, was affecting development in the Horn of Africa. He urged the international community to step in and support regional stability efforts. The fluid situation in the region, he said, has been worsened by new security threats arising from terrorism and radicalisation by militant groups. “Ecological fragility and natural disasters in the face of scarce resources in the horn of Africa, have complicated the pursuit of development,” he said. Mr Ruto, who is representing President Uhuru Kenyatta, said the East Africa region has shouldered the burden of refugees and security threats emanating from Somalia without adequate international support. He said Kenya has hosted hundreds of refugees from Somalia and deployed soldiers and finances to fight Al-Shabaab militants. The efforts, he said, have seen large parts of Somalia liberated, making it possible for the Transitional Federal Government to declare its readiness to receive its refugees. “Kenya has committed to Sh1 billion (USD 10 million) in new money to support the safe, dignified and orderly repatriation of the more than 400,000 Somali refugees in Kenya,” he said. Mr Ruto said that in addition to the international community standing by to watch the regional efforts, the European Union reduced its financial support to Amisom by 20 per cent starting March this year. Efforts to convince the UN Security Council to finance the operations have yielded negative response, he said. Mr Ruto urged the UN Security Council to upgrade Amisom to the status of a UN peace keeping force. “I once again implore members of the Security Council to take this matter seriously and align the mandate of AMISOM to the threat levels in Somalia on land, air and sea,” he said. The DP accused the international community of failing to meet last year’s pledge of Sh50 billion to help in the repatriation of refugees from the Dadaab Refuge Complex, leaving the burden to Kenya. Only Sh1 billion has been received, so far. “This failure of solidarity has placed disproportionate burden on Somalia’s neighbours and risks undermining the credibility of international institutions,” he said. With the war-torn country going into elections this year, he urged the international community to step and ensure the political transformation in Somalia. “Somalia requires the full support and commitment of the international community to complete the process of political transition that will set the stage for peace,” he said. He said South Sudan, which faces a complicated situation, could easily plunge the entire region into a humanitarian crisis in the absence of quick intervention. He informed the UN General Assembly that Kenya has presided over peace efforts and urged the international community to channel its funds through Igad to restore peace and stability in the youngest nation in the world. He informed that UN General Assembly that Kenya, which chairs the UN Peace Building Commission, has fulfilled its pledge to support global organisation’s peace keeping efforts after the Engineering Capacity Troops Training for African Peacekeepers was concluded in Kenya. He called for radical reforms in the UN system to grant African countries a fair share in its decision making organs. Describing it as “historical injustices in representation”, he urged the UN General Assembly President Peter Thomson for form a team within one year to start working on the reforms. “I take this opportunity to request you, Mr. President to prioritise the appointment of the next chair of the intergovernmental negotiations on UN Security Council reform and to preside over a year of real progress on this matter,” he said. He also called for the upgrading of the UN Office in Nairobi. Mr Ruto said the big divide between the rich and the poor nations is largely driven by disparities in world trade and investment. Even though developments in technology such as Kenya’s Mpesa were changing the world, he said vulnerability, poverty, violation of human rights, instability and environmental fragility still stocks the developed world. He said Africa, which will have a higher population than China and India combined by 2050, only accounts for three per cent of global trade. “Today, Africa’s of global trade stands at 3 per cent. This comprises primarily crude oil (50%), unprocessed minerals (20%) and raw agricultural produce (30%). Unless the trade imbalance is reversed as a matter of urgency, this will accentuate vulnerability, poverty, risk of insecurity and instability for both Africa and the rest of the world,” he said. 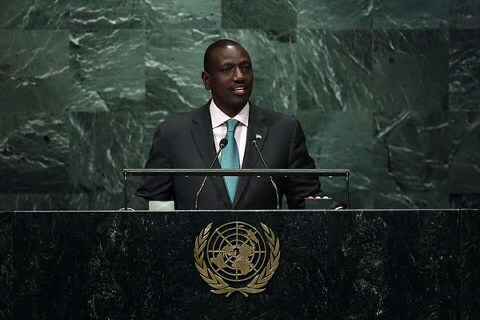 Mr Ruto informed the UN General Assembly that Kenya hosted three international conferences among them UN Environmental Assembly, UN Conference on Trade and Tariffs and the Tokyo International Conference on Africa Development. September 22, 2016 in East Africa.